1. Wash the unakka kappa pieces well and soak them overnight in enough water. Break them down to small pieces. Rinse well. 2. Crush grated coconut adding turmeric powder, dried red chilies and cumin seeds in the small jar of a blender. 3. Cook the tapioca pieces and soaked vanpayar / red chori in a vessel adding enough water (around 4 – 5 cups). Cook until both are done. Add salt and mix well. Drain excess water. Top it with grated coconut mixture and some curry leaves. Cover and cook for a minute. Open the lid and mix well. Cover and cook for a few more minutes over low heat. Add a tbsp of coconut oil and mix well. Keep covered for 10 minutes. 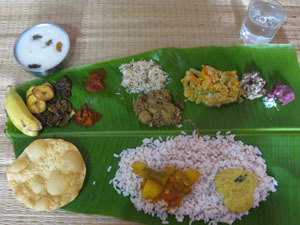 Serve with thenga chammanthi / fish curry / prawn curry etc. It tastes best after an hour.